On 5 August 2012, fighting broke out between Karen National Liberation Army (KNLA – pro-democracy ethnic resistance) soldiers and Burma Army Border Guard Force (BGF) Battalion 1014 in Mae Hsee Village, Bu Tho Township. The fighting killed four BGF soldiers and wounded two KNLA soldiers. According to KNLA Major Kler Doh, the KNLA instructed BGF forces to not build any new military camps and to not attack in the area. Battalion 1014 is led by Maung Gyet and KNLA collected five rifles, one pistol and a communication system from the BGF forces. As of 14 May 2012, BGF Battalion 1014 (previously led by Maw Nyunt Thin) was based in Meh Pree Village. There, they demanded food from the villagers in Htee Htaw Kee Village, Htee Baw Kaw Village and Meh Pree Kee Village. On 17 May, 2012, they again demanded more food from villagers in Htee Htaw Kee, Meh Pree Kee and Htee Baw Kaw Villages. Villagers from three villages in the areas were forced to work for the soldiers. Three people from Meh Pree Kee Village, two people from Htee Baw Kaw Village and one person from Htee Htaw Kee Village were recruited for labor. All six people had to cook for BGF soldiers in their camp and carry water on a three-day rotation. BGF Battalion 1013 is commanded by Hla Kyeh and BGF Battalion 1014 was led by Maw Nyunt Thin with Maw Chit serving as the second in command. 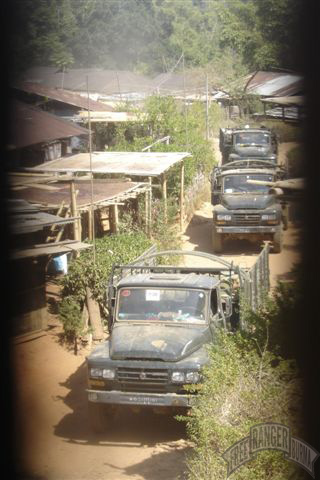 In Taw Oo District, Burma Army troops remains at their posts in local villages. Despite requests from Karen National Union (KNU – pro-democracy ethnic resistance) leaders to discontinue military activities throughout Karen State in compliance with the 12 January 2012 ceasefire agreement, improvements on the Burma Army outposts continue to take place. FBR team members have reported that Burma Army soldiers have confiscated substantial building supplies and personal belongings, including lumber and bamboo, from local villagers for military resupply. On 24 April 2012, Infantry Battalion (IB) 35, stationed at Play Hsa Loh Camp, demanded forced labor from villagers in Play Hsa Loh Village, demanding that the villagers cut and transport banana leaves to the nearby Burma Army Camp. Every one of the 65 households in Play Hsa Loh Village had to contribute and carry 3 sheets of banana leafs to help cover structures in the Burma Army camp. On 1 April 2012, following the closing ceremony of a training in Ba Yit Naung Tak City, Burma Army soldiers fired multiple small handguns and mortars around the camp. As a result, many villagers’ crops in the area were damaged, including dogfruit trees, cardamom fields, betel nut fields, areca palm fields, coffee fields. 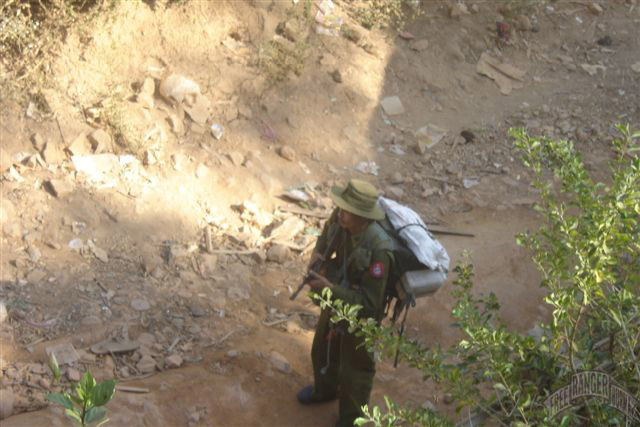 FBR teams have recently reported that last year, on 15 August 2011, IB 72 of the Burma Army arrested U Tin Myint, a 47-year-old male resident of Shwe Nyaungbin Village. U Tin Myint was accused of deserting the Burma Army and collaborating with the KNU. Formerly a soldier from Battalion 53, U Tin Myint is from Kyauk Kyi Village and has four children. Upon capture by the Burma Army, U Tin Myint falsely reported that Saw Klo Say Doh, 35 years old, and Saw Ko Ko Aung, 37 years old, were also involved in collaborative dealings with the KNU. The families and friends of these men had no idea where they had been taken until November of 2011, at which time they were discovered to be incarcerated in a Taw Oo prison. While held, Saw Klo Say Doh and Saw Ko Ko Aung were repeatedly tortured as they served out their respective sentences. U Tin Myint was sentenced to 20 years incarceration, while the others were dealt sentences of three years. Subsequently, the Burma Army reduced the sentence of U Tin Myint to 15 years imprisonment, and Saw Klo Say Doh and Saw Ko Ko Aung to two years imprisonment. A Burma Army soldier belonging to Division 66 outside of Kaw Thay Der Village, Htaw Ta Htoo Township, Taw Oo District. In February 2012, Burma Army Division 66 sent food to Kaw Thay Der Village, Htaw Ta Htoo Township, Taw Oo District. FBR teams in the area recently reported that last year, on 9 August 2011, the second-in-command of Burma Army IB 17, Kyaw Lwin, raped a 35-year-old woman from Ka Hpraw Village, Ler Mu Lah Township. She reports that Kyaw Lwin came to her home in Thay Pu Village at midnight with another Burma Army soldier and forced her onto the ground, where he then raped her. She did not report the incident to the village headman. Light Infantry Battalion (LIB) 292 and Artillery Battalion (AB) 408 are both operating in the area. Since the ceasefire, the Burma Army has resupplied units with ammunition, food and troops. A new Burma Army camp was also built near Myin Kaw Paw Village. In Ler Doh Soh Township, Italian Thai Development (ITD), a Thai corporation, is building a deep seaport near the city of Dawei as well as building a highway from the seaport to the Thai border, expanding the capacity of the area for international commercial trading. In order to build the seaport and highway, many villagers have moved out of their homes so that the area can be developed by the corporation. Many reports describe instances in which villagers willingly sell their land for a price that they deem appropriate. However, there have also been reports of unfair dealings on behalf of ITD, with both the actual delivery of the compensation and the fairness of the price being questioned. Villagers that have been affected by the construction, commonly known as the Dawei Project, have formed a grassroots committee and demanded that they be compensated for their displacement and loss of crops and plantations appropriately. ITD agreed to compensate those displaced by the project. Infantry Battalion border camps remain in Tee Moo Kee, Mu Ka Paw, Daw Kyi, Thaw Po Mae and Maw Taun. The Burma Army has been collecting taxes from everyone crossing back into Burma from Thailand. Sein La Maung, the Governor of Shwe Gyin, confiscated 2.5 tons of wood from Aung Aung, a villager from Ma Dauk Village. He forced Aung Aung to use his own bullock carts to transport the wood to the home of Sein La Maung, which required 12 separate carts. Aung Aung was not compensated for his wood, his labor or the use of his bullock carts. Heavy rains have affected the plains of Ler Doh Township, with ongoing heavy rainfall since the middle of July . Some schools have been closed due to flooding, and ten village tracts have experienced heavy losses. 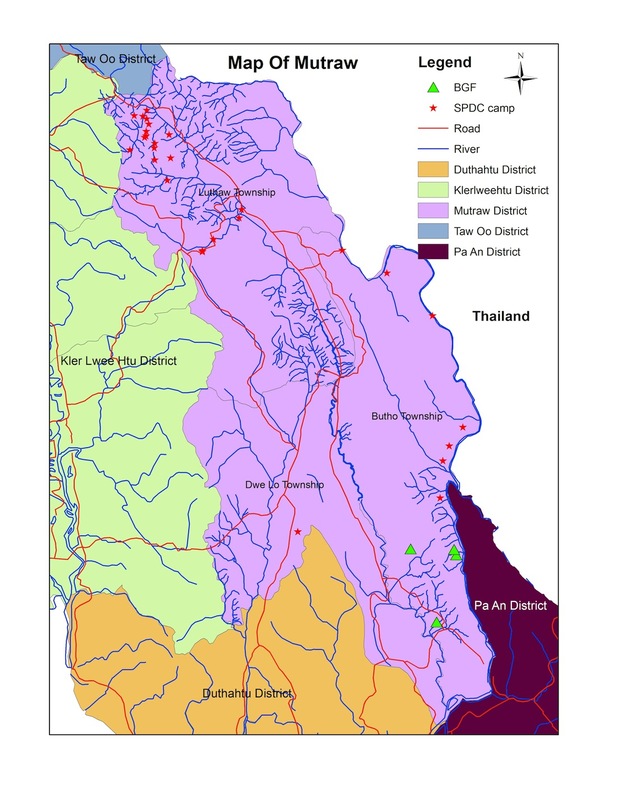 The following village tracts lost several homes; Patala Village Tract has lost 244 houses, Thu Ka Bee Village Tract has lost 52 houses, Noh Gaw Village Tract has lost 172 houses, Weiladaw Village Tract has lost 244 houses, Haythawei Village Tract has lost 250 houses, Toewazeit Village Tract has lost 70 houses, Talayzeik Village Tract has lost 300 houses, Maoopin Village Tract has lost 188 houses, Noh Nya Village Tract has lost 108 houses, and Kamoe-Eg Village Tract has lost 20 houses. In totally, 1648 houses have been lost in Ler Doh Township since mid-July due to heavy flooding. Many people are now in search of food and shelter. Burma Army troops are remaining within their camps, and have ceased all patrolling. Villagers are free to travel, and no longer feel they are in danger when walking on roads. Military activity continues throughout Doo Tha Htoo District, with LIB 104, Light Infantry Division (LID) 44, IB 2, and LIB 207 all active in the area. LIB 104, with Nay Min Tun serving as the Commander and Zin Ya Moe serving as a Second Commander, are active throughout Doo Tha Htoo Distict, with some troops specifically active in Pa’an Township under the leadership of Zin Ya Moe. LID 44 is commanded by Khin Main Than and is currently stationed at Pa Nwea Klar Camp. IB 2, who is commanded by Aung Naing Oo, recently took the place of LIB 207 at Lay Kay Camp (where the camp leader is General Nyut Win), though later moving onto Yo Klar Camp. The second-in-command of IB 2 also has troops at Yo Klar Camp, where the camp leader is General Aung Htat Soe. FBR teams report no decrease in military activity in the area.